Fighting CCS and CTE for those with special needs is especially heart rendering. I’ve had the honor of speaking with several parents of these wonderful students. In my educational experience, I’ve worked with these families and seen how an education that fits them, NOT streamlines them is a delight. However, when I speak with parents today, they are not delighted, their students are miserable, and all involved feel absolute anger and frustration toward the misuse of education and IDEA funding. What’s IDEA funding? It is a federal statute set up in 1975. 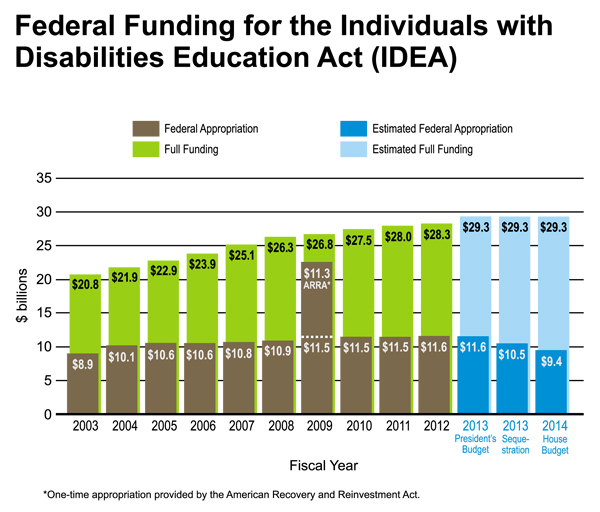 It’s original name was “Education for All Handicapped Children”. 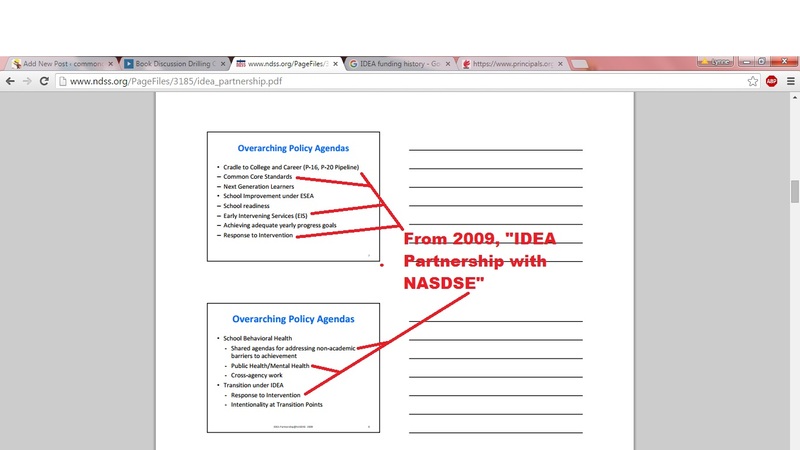 Congress, at some point, began to refer to it as “IDEA”. The name then or now isn’t so important as WHAT the funding does. From what I’ve found the Act has 2 purposes: a) due process detailing parental rights, and b) permanent grants available to states for ‘free, appropriate public education to all children with disabilities in the least restrictive environment’. Let’s see if we can pinpoint what other groups are supportive of the shift where IDEA went from its original purpose (stated above) of ‘appropriate education in the least restrictive way’ and when it aligned with Common Core. Why this matters in 2015: 1) if you’re a new anti CCSS Warrior, this may be information which is new to you; 2) knowing the dates of the pro CCSS Machine’s activities can help those who’ve been fighting CCS and all its other entities by tracking when and where it showed up in their states, who might be involved and knew what the states were in for, but went along with it, etc. Below is a screen shot from the IDEA Partners stating what they believe to be their purpose in the Pipeline. Be sure to click on the website address directly above the screen shot, scroll down and click on ‘Dialogue Guides for Cradle to College and Career’. Once there you can see an ‘Early Learner’ Guide, which is for pre-K to 3rd grade; for Middle School, it’s the “Breaking Ranks” reports I told you about in this past weekend’s news. Lastly, the transition for middle to high school in included. Other than the national group of those secondary school principals I told you about, you can see how the ECS, ‘Education Commission of the States’ is cited as a source for the dialogue documents. If you are curious as to the alignment of the ECS to CCSS and CTE? Don’t be. It is 100% evident on their website. See below. Bottom line for the musings today: We’ve got some great information for using to fight the Core, let’s get busy!